Rock Magazine Ads for… Crabs? In our volunteer work at the Library of Congress (Packard Campus), there was apparently much to be gleaned about American culture from the 1970s rock magazines we inventoried. 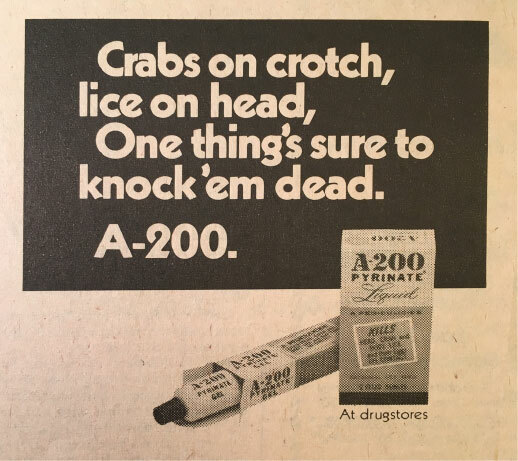 One of many ads for A-200 Pyrinate gel. Initially, it seemed a bit absurd. Why would rock magazines be advertising a chemical solution for lice and other body parasites? Could this be related to the “free love” movement of 1960s and 70s? Was there an outbreak? 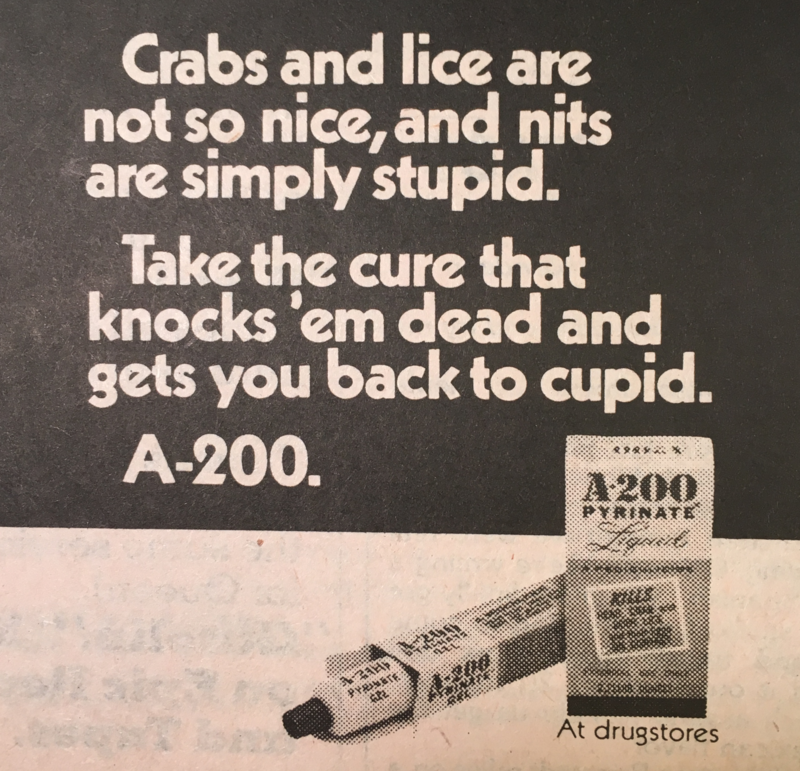 A bit of research reveals that up until 1972, DDT was the preferred insecticide for body lice. It was widely used, most famously in prison and military situations. Come 1972, research suggested that DDT might not be the best to use on humans, as it builds up in adipose (fat) tissue rather than passing out of the body. Too much DDT buildup is toxic to humans, and was eventually blamed for increased risk of developmental delay in children, increased cancer chances, and male infertility- not to mention the serious environmental hazards. In 1972, the EPA issued a “cancellation order” on DDT use. With DDT out of the picture, there was a significant gap in the market for treating body lice. It appears that A200 Pyrinate was simply capitalizing on the opening in the market at that time. Having an archives of rock music magazines from the 1970s enables us to rediscover medical research history and unique cultural “gems” like this one!